Looking at sample wording for bridal shower invitations will be helpful, especially if you are planning your first event. You can do this by reading a variety of cards. Your choices will include formal, casual, soon to be Mrs., or couples showers. Each may be slightly different. Let the wording you choose reflect the style of the party are having. You want to coordinate your plans from start to finish. The following are some sample ideas. Many bridal showers will fall under this category. The following includes the typical information. Are you planning something more formal? in honor of Mary Casey. A carefree or casual style is reflected in the following words. Please bring a copy of your favorite recipe. Wondering how to share the news of a shower for two? 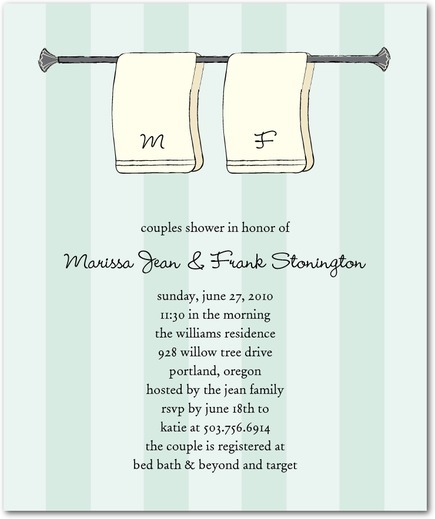 • Browse Shutterfly for sample wording for bridal shower invitations. You can also look at your favorite party shop or online store for sample bridal shower invitations. Then choose one that suits your needs. • Do you have an invitation etiquette question? • What are the information basics to include? • How can you make your invites unique?